The Duquesa Charitable Society of St George continues its support of local charities with the donation of 1,000 euros to Age Concern – Estepona and Manilva, this month. The St George Charity has a close relationship with the charity which provides services and support to elderly expats in the area. At the presentation Age Concern – Estepona and Manilva’s president and vice president, Tony Aldous and Marie-Andree, thanked the St George Charity’s president, Dean Shelton, for this continued support. 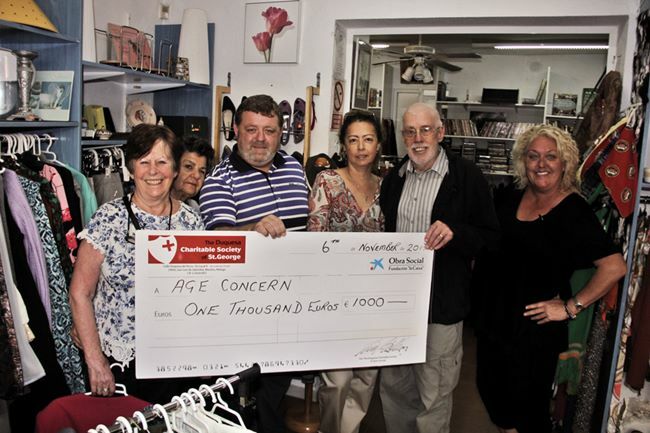 You can help Age Concern by visiting their shop in Calle Zaragoza in Estepona. The shop is open Monday to Friday from 10 am to 1.30 pm.